Using period-appropriate filming techniques for movies set in the 20th century is hardly new, especially in the use of melodramatic lighting and color. But Stanley Kwan's Center Stage (a.k.a. Actress) actually incorporates the techniques into the film at hand, the biopic of 1930s star Ruan Ling-yu doubling as a recreation of both period-appropriate Chinese melodrama and the postwar American melodrama as practiced by Sirk, Ray et al. By going outside the stylistic touches of the film's time to broadly canvas melodrama as a fluid, evolving, international artform and expression. As if to to prove to the audience why they should care for the film's subject, Kwan establishes the artistic worth of the medium and genre in which she worked. Yet this also sets the stage for Kwan to show how the films in which Ruan gained her fame—tales of harassed and martyred women misunderstood and abused by social forces and an ignorant mob—were reflected in the tragedy of her short life. Her penultimate film, New Women, portrayed the press as an insensitive pack of jackals who drove a women to her suicide, an outrage that prompted vindictive newspapers to...drive this woman to her suicide. It is a twisted irony, and the director adds a layer of his own by including black-and-white scenes of himself and the actors as themselves, discussing their "characters" and interviewing surviving members of the Chinese film industry who worked with the actress. 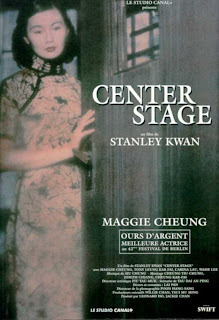 The film's first scene depicts Kwan explaining Ruan's career arc, which began with minor roles in fluff before she went to a film studio that prided itself on more progressive, artistic work and her career exploded. Maggie Cheung, who plays Ruan, notes with a laugh that her own path recalls Ruan. In another case of life imitating art, Cheung would use this very part to transition from supporting roles to becoming one of the most respected actresses on the international stage. When making a film biography of a film star, one supposes that self-reflexivity is unavoidable. The shift to color when Center Stage moves into the past floods the screen with golden light, radiant reds and the cool blues of Technicolor night. Seemingly everything is a reflective surface, the ascendant star always surrounded by twinkles of brilliant light. Yet as with so many melodramas, all that florid beauty serves as a cage for the protagonist, who finds herself restricted not only by the sudden, overwhelming fame that falls on her young shoulders but by the male-dominated system that exploits her to cast a bitterly ironic image of a progressive studio. Kwan shows the shooting of Ruan's most famous films from behind the scenes, his color stock picking up the extra makeup pancaked onto actors's faces for the black-and-white silents, the male directors calling out from behind the camera to give Ruan instructions during a shot. As a symbol for the Lianhua Film Company, Ruan and her bevy of impoverished, sacrificial prostitutes and workers put them at the forefront of class-conscious filmmaking, yet the audience for Center Stage sees all the strings attached to the marionettes. Nevertheless, Kwan and Cheung do show Ruan's talent as an actress. Where the men on-set tend to give pointers through a simplistic recap of how the character feels as a result of what has happened to her, Ruan can actually empathize with the characters set up as props for the studio's pro-Communist viewpoints. On the set of Little Toys, she coaches her costar, Li Lili (Carina Lau), by succinctly and eloquently guiding the other actress to truly picturing the scene as it affects their characters. So skilled is Ruan at inhabiting her characters that her youth—she did not live to see her 25th birthday—feels irrelevant to the maturity and dignity with which she imbues her roles. In Little Toys, for example, Lili's character in question is Ruan's 17-year-old daughter. But Cheung and Lau play the actresses as taking it as seriously as the real people appear to be in the clips of the actual Little Toys Kwan includes in the film. Throughout, Cheung plays Ruan not as a wide-eyed girl off the bus who finds herself swept up in stardom but an intelligent woman who knows full well that her entire professional life is being decided by studio executives who want her to always be "the next ______," the new big thing who will one day be thrown out when she is "too old" at 30. Likewise, Ruan is aware she must work overtime to make sure the details of her chaotic personal life never escape closed doors lest it destroy. And when, in the wake of New Women's disastrous press screening, she looks in a newspaper and sees headlines about her affair, her scream sounds like that of a mother who lost her child. She knows in an instant what this means, and she cannot cope with it. Soon, Ruan would be dead, immortalizing her as an icon in China but also preventing her from working into an era with more consistent film preservation. As if to further complicate her mythic status, so many of the films she made are now lost, as explained by intertitles Kwan places over stills and surviving reels of those movies. That the film partially "recreates" those movies by showing their production adds a metacinematic element to its reconstruction of the star's life by rebuilding the work that, in many cases, no longer exists. In the climax, Kwan waves together real images of Ruan's funeral with Cheung posed for the same, but he also contrasts his sets standing in for Lianhua studios for the real thing, in disrepair at the time of filming. The studio fell into decline after Ruan's death, largely because of the escalating war with the Japanese. But Kwan turns this into a final melodramatic flourish, the actress' demise turned into a final revenge upon the company that used her by turning the tide in their fortunes. In her films, Ruan symbolizes the injustices of society; as an avatar, she comes to stand for the injustices within the industry that claimed to take a stand against them. In other words, it is an awards-ready film about the fraudulent and hypocritical nature of so many awards-ready films. The story about the center stage is interesting topic.I will bookmark your blog for the regular visit.Please update more things in the blog.